When I heard that Carole was reading Far From the Madding Crowd for her April classic novel, I asked her if I could join in. I have had the book on my tbr pile since I heard it was being made into a movie, so it was the perfect opportunity. Like a lot of classics, this book is slow to get going. Not unpleasantly slow, but it takes its time introducing you to the countryside and the characters. But, once all the characters had been introduced, I found myself wrapped up in the story and reluctant to put it down. This is my second Thomas Hardy novel, but it will not be my last. I hate to be thought men’s property in that way, though possibly I shall be had some day. Well, what I mean is that I shouldn’t mind being a bride at a wedding, if I could be one without having a husband. Thoroughly convinced of the impossibility of his own suit, a high resolve constrained him not to injure that of another. This is a lover’s most stoical virtue, as the lack of it is a lover’s most venial sin. Farmer Boldwood – the farmer next door. Handsome, distant, reserved, never interested in a woman until Bathsheba came along. She thoughtlessly sends him an anonymous Valentine just for fun, and ends up paying a big price for it. It was a little creepy how persistent this guy was in pursuing Bathsheba. He was not above using guilt and didn’t seem to care that she was obviously completely miserable at the thought of marrying him. Sergeant Francis Troy – the charmer. Troy sweeps in with his good looks, youth, and charm, and Bathsheba finds herself melting into a puddle. We shout at her, ‘No, no!’, but she can’t stay away. And Troy’s deformities lay deep down from a woman’s vision, whilst his embellishments were upon the very surface; thus contrasting with homely Oak, whose defects were patent to the blindest, and whose virtues were metals in a mine. 2. The story kept me guessing. So, we have one woman and three suitors. I thought I knew what was going to happen, but the story was harder to predict than I thought. I think I was also thrown off by Hardy’s reputation of writing tragic, depressing stories. 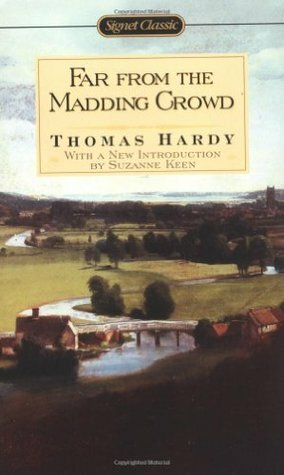 The only other book I have read by Hardy is Tess of the D’Urbervilles, which was horribly depressing (but I loved it). Far From the Madding Crowd seems like a comedy compared to Tess. 4. Men in those days were sure quick to declare their undying love for a woman. I think this is part of what made the novel so comedic; this tendency for everyone to sound so dramatic in their speeches to each other. I shall do one thing in this life – one thing certain – that is, love you, and long for you, and keep wanting you till I die. I cannot say how far above every other idea and object on earth you seem to me – nobody knows – God only knows – how much you are to me! Put shortly, it is not being able to think, hear, or look in any direction except one without wretchedness, nor there without torture. Considered a Victorian realist, Hardy examines the social constraints on the lives of those living in Victorian England, and criticizes those beliefs, especially those relating to marriage, education and religion, that limited people’s lives and caused unhappiness. Such unhappiness, and the suffering it brings, is seen by poet Philip Larkin as central in Hardy’s works. So many good quotes in this book – you didn’t think I was going to leave you without any, did you? It may be observed that such a class of mug is called a God-forgive-me in Weatherbury and its vicinity for uncertain reasons; probably because its size makes any given toper feel ashamed of himself when he sees its bottom in drinking it empty. Men thin away to insignificance and oblivion quite as often by not making the most of good spirits when they have them as by lacking good spirits when they are indispensable. When a strong woman recklessly throws away her strength she is worse than a weak woman who has never any strength to throw away. One source of her inadequacy is the novelty of the occasion. She has never had practice in making the best of such a condition. Weakness is doubly weak by being new. (So true.) A resolution to avoid an evil is seldom framed till the evil is so far advanced as to make avoidance impossible. It appears that ordinary men take wives because possession is not possible without marriage, and that ordinary women accept husbands because marriage is not possible without possession. (I love this one, and have been wondering about it ever since – does anyone have any thoughts on it?) It is difficult for a woman to define her feelings in language which is chiefly made by men to express theirs. Don’t forget to have a look at what Carole (at Barda Book Talk) thought of the book! Oh, this is one of my favorites! You know there’s a new movie coming out, right? Carrie Mulligan as Bathsheba? I don’t know how she’ll be. I picture her colder than Carrie, with her dimples. Julie Christie was perfect. Yes, I can’t wait to see the movie! But, I do worry about the casting. Hopefully it will be good! I’ll have to check out the version with Julie Christie. I also loved Alan Bates as Gabriel. We’ll just have to see. The Julie Christie version is wonderful. Let me know what you think if you go see it! Sure, I will. This may be because I am out of date, but I’m not at all familiar with any of the male actors they have cast. But I’m looking forward to it, anyway. My husband doesn’t like what he calls “costume dramas,” but I think for this one he will go. I don’t know any of the actors, either. I ‘m terrible at keeping up with actors and movies. I didn’t used to be, but my husband doesn’t like going to the movies much, so I have lost track of all the newer people. Ooh, sound good! Thanks for the link! Oh, thank you so much for joining me during this reading, Naomi! I had so much time reading your post! This: “I loved reading about life on an English farm in the 1840s; the tasks that needed doing, the meals that were shared, the conversations between the farm workers, the expectations of both men and women, the etiquette of courting and marriage, and the class differences.” YES, YES, YES!!! Agreed!!! We also chose to highlight the same quote! “It is difficult for a woman to define her feelings in language which is chiefly made by men to express theirs.” So many layers here. Baths, I find, had trouble recognizing real love, whereas Gabriel fell in love with her from the start. I also love that a man, in Victorian times, wrote it. I love how you included a bit about Hardy. I must confess, I haven’t read much about him. You make me want to learn more. Thanks for sharing your thoughts and for including a link to my blog post. I wish we could go to the cinema together to chuckle at the silly parts. Oh, that would be fun! Let me know if you do go see it! I was also intrigued that it was written by a man in the 19th century, which is why I ended up looking him up and reading a bit about him. I’d like to know more, though. I also noticed that we both had reading about the English rural countryside in the 1840s as a highlight. I especially liked it knowing that it was written by someone who was there, and not just doing research. So interesting! Oh no. I’m sure it will come soon! There’s an interview with the filmmaker Thomas Vinterberg on Q (from Thursday, I think). So I’ve never really had the urge to read any Thomas Hardy, being of the misguided belief that a Victorian man would be terrible at writing interesting women. I tried to read Tess of the D’Urbervilles once and could not get past the dead horse. But just the other day I had some time to kill and downloaded Tess onto my phone and was actually really into it. Which has left me wondering if maybe I shouldn’t reconsider my position on Hardy. And this review, those quotes…it does sound like something this Austen-Gaskell-Elliot reader may enjoy. Yes! Give him a try! This one and Tess are very different, but I have loved them both. I find he writes women surprisingly well (unlike Dickens), which is one reason I think it would be interesting to read about him. If you finish Tess, let us know what you think! Wow, great quotes! I understand why you want to mull them over. I also like how you pointed out how funny it is the men make such heartfelt declarations of love. I find it very romantic and sweet, but amusing too. Imagine if men behaved like that today. Imagining men behaving like that today is part of what makes it so funny. I like it too, though. I know it is only fiction, but I would like to go back in time to see if any of them really talk like that. This is a wonderful review. I did not even know I wanted to read this book. I’ve heard it is good, a classic for a reason, but it never really piqued my interest. I think you may have just changed that! Also, can I tell you how much I love the name of your blog? LOVE. Also, I’m happy to hear you like the name of my blog – it’s nerve-wracking trying to come up with a good blog name – almost like naming a child. 🙂 Thanks for linking to my review! It’s good to see a review of this classic! I had to study The Mayor of Casterbridge at school and the requirement to analysis the life out of it turned me away from Hardy for several years. It took me a while before I could contemplate a return to his work, but it was worth the wait. A fine writer. I can see that happening – too much analysis can ruin a perfectly good book. 🙂 Sometimes, they are just meant to be enjoyed! I’m also reading this at the moment. I’ve struggled a little with Hardy in the past so it’s good to hear you enjoyed it. You’ve encouraged me to keep persevering! I hope it ends up being worth the read for you! Let us know how it goes! 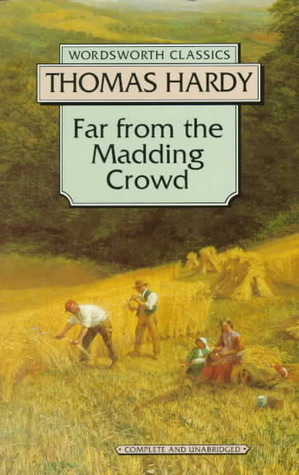 I’ve never read anything by Hardy, but 2015 will be the year I read Tess of the D’Urbervilles (I hope), and I’ll get to Far from Madding Crowd too eventually. I’m glad you enjoyed it, and based on the link you provided, I’m curious to read the book about Harding as well. Your quotes are awesome. These quotes are just the beginning – there are quite a few that I left out, because it was getting ridiculously long. I hope you love Tess! I am a huge Hardy fan I just love his novels and stories but particularly fond of those novels of rural life like this one Under the Greenwood Tree and The Woodllanders. Far from the Madding Crowd and Jude the Obscure are two of my favourites. I am thinking of going to see the new film of Far from the Madding Crowd this weekend. I was thinking my next Hardy novel might be Jude the Obscure, so it’s good to hear it’s one of your favourites. Jude is probably a marmite book – people either love it or hate it. It is a pretty sad story – just to warn you. I saw the trailer. I can’t help comparing Carey Mulligan to Julie Christie and Julie Christie, well there was nothing quite like her. But I am glad they are finally going back and remaking some of the classic novels. I must say that I love Roman Polanski’s “Tess”. Hardy is such a great writer. Glad to see you are reading him. You’re the second to get behind Julie Christie as Bathsheba. It might be a good thing for me that I haven’t seen that version – I won’t be comparing the new one to the old one (if I eventually see it). I love it when they make movies out of the classics. It was also the final push I needed to finally read the book, since I wouldn’t have wanted to watch the movie without having read the book first. What’s the fun in that? I read this one years ago, pre-blogging, so I don’t remember that much. I didn’t do nearly so much critical thinking back then. I’d love to revist it. I read The Mayor of Casterbridge and Tess of the D’Ubervilles around the same time. There was something so quiet and comforting about the way he writes, as I recall anyway. Love all the quotes. The last? Well I guess that the formal side of language would have been pretty male – I mean, VIDA counts and what not aren’t looking so great, imagine in 1840? 🙂 It’s kind of meta and almost a little suspect, having been written by a man… I dunno. Comforting is a good word for the way he writes. I wanted to read another one right away, but there are too many other books calling to me. I also wondered about the fact that the quote was written by a man. These are the things that make me want to read about him. I don’t tend to read classics but I do read Hardy. Adore him in fact. Not read this one (it’s on the pile!) but love Jude the Obscure (heartbreaking), Tess (which I studied at school) and The Mayor of Casterbridge (gripping). Another rec for Jude the Obscure – now I can’t wait to get to another one! The Michael Winterbottom film with Kate Winslet & Christopher Ecclestone is also highly recommended. Make sure you have a box of tissues handy! Thanks! I didn’t know about this one! I think we share a love for quotes, Lynn. I even had to weed some out so my review wouldn’t be too long. I’m glad I’ve piqued your interest in the book! Sounds like the sergeant should be called “the player”. I definitely need to read this one especially since I’ haven’t read a classic in ages and this one should be released in film soon. I like the way you went about this post. I’m intrigued…even though I know it’s probably going to end badly. I read Tess. The Mayor of Casterbridge is another one that sounds interesting that I want to pick up. I was thrown off by my experience with Tess, as well, which made the book more fun – I wasn’t quite sure how it was all going to end up. The fact that it’s coming out as a movie is what gave me the extra push I needed to finally pick this up, and I’m glad I did! The Mayor of Casterbridge sounds good, too! I’ve not read this one but like you loved Tess of the D’Urberville’s although it is a depressing read. Love the way you’ve structured this post too! Thanks! If you loved Tess, then there is a good chance you would like this one, too! YAY – I had such a good time listening to the audiobook of this. The last part actually got quite exciting!! I was never quite sure what was going to happen. I adore Carey Mulligan so am looking forward to the movie. And on to Jude Obscure – cuz MOVIE! love reading classics and then seeing what the films deliver. I agree. I think my favourite book to movie adaptations are of the classics. The trailer for Jude does look good! I’ve gone to check it out! 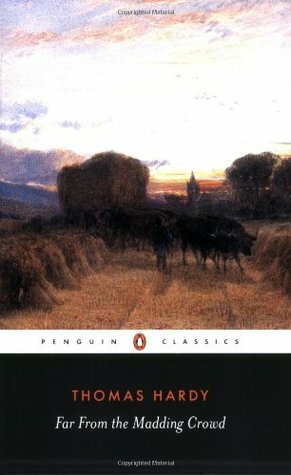 I have always stayed away from Thomas Hardy because of his reputation for sadness, and sadly, I am not too interested in rural farm type stories, but a couple of years back I read Middlemarch, which I also thought was not for me, and ended up enjoying it. I think I”ll give this one from Hardy a try as well. You might like it – it is not nearly as sad as I thought it was going to be. It is actually quite funny at times! I think some of it was meant to be comical, but other parts, like the dramatic speeches, might just seem funny to us now. The situation itself, I think, is meant to poke fun at the way men and women interact with each other and all the rules surrounding courtship and marriage. That’s my take on it, anyway (without being a literary scholar of any kind, or having read about it past the Wikipedia account). Oh I would love to read this novel before seeing the movie. You did a nice review. Have you seen the movie yet?! And if so, how does it compare?! Bathsheba is such a terrific name for this role. It’s too good to be true. I haven’t seen the movie yet, but am really hoping to. I don’t see too many movies, but this is one I’m going to try to see. Hopefully, I will hear soon from someone what they think of it (and how it compares to the book).